Great Dane Pictures are such fun to take because they love having their pictures taken. 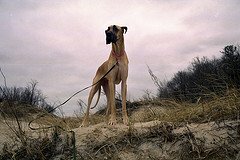 Here are some Tips on taking Great Photos of your Fabulous Danes. Get OutDoors You want to be outside, in as bright as light as possible, to help capture the action. Use that “action” mode On most pint-and-shoot cameras the graphic for this is of someone running (also called “sport” mode). The faster shutter speed is always the best for capturing a dog in motion. If your dog is older, use the “portrait” mode. Choose a focal point With most dogs, you need to decide if their eyes or the tip of their nose are going to be in focus. Very rarely are you going to get both. The nose is most likely to capture the focus mechanism of the camera, but not the eye. Use the “manual focus” setting on your camera to focus on your dog’s eye instead, and use “macro” setting since you are shooting a close-up. Back Up! Copy your photos to a CD and a DVD. Use gold CD’s for storage They are better quality are more archival. Puppies Place pups and small dogs on sofas, chairs, benches, and other places from which they cannot jump off too easy. Cats and Dogs It is best to get the cat comfortable first and then bring the dog into the picture. Black dogs Position the dog in the sun outside, or use a higher shutter speed, higher-speed film, and a fill-flash inside. Get low Take pictures at the dog’s eye level (which will be easy if you have a dane) so you can see the world as he does. Make noise A harmonica, musical instrument, or high pitched sounds with your own voice will often cause dogs to tilt their heads. Research breed profiles to gain a better understanding of their behavior characteristics. Timing Pick your time of day carefully and avoid the midday sun or “top” light. Dress down Do not wear your best clothes and be prepared to spend a lot of time lying on your stomach. Health check Always consider the healthy, safety, and welfare of you yourself, the pets, and other people present. Word of mouth is a great way to find a pet photographer. Ask friends and colleagues if they have ever used a professional (especially if you like the dog photos they have displayed at home or work), and go to dog friendly events in your neighborhood. Photographers are often working at dog shows, agility trials, and community-outreach events such as AKC Responsible Dog Ownership Days. You can also search for a dog photographer in your area online. Choose a website that is professional, paying attention to each photographer’s style. Think about what you would like in your image, and try to find a photographer whose work best matches your vision. You should feel comfortable with the person you choose. Prices vary by photographer, location, and services offered. Canine portrait sessions with some photographers start at $350, with extra fees for prints and high-res images on discs. A less costly alternative: Petco offers photography services. Groom: Give your dog a bath and a nice brushing the day before you plan to take pictures. During the photo session, have brushes for gooming and towels for wiping runny eyes and drool on hand. Plan: Know the types of photos you want before you start taking them. Think about what the photos will be used for. What poses and backgrounds do you want? Consider how to reflect your dog's personality or working heritage in the photo. If you are photographing outdoors, make sure the site is secure and away from traffic. Look for distractions and clutter in the background that could ruin the photo. Get help: Ask someone your Dane knows to help so you can focus on working the camera. This person can reposition your dog, hold him on his leash until you are ready to take the photo, and get his attention with treats, toys, noise makers, or balls. Patience: Be patient and use positive reinforcement while taking pictures. Now is not the time for discipline or losing your temper. Take breaks when needed. 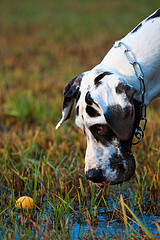 Have fun and make it fun for your Dane and he will give you some great shots! 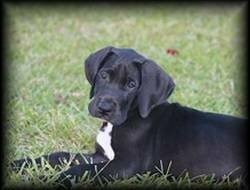 Get on your dog's level: With a Great Dane this will be easy to do. Try and get some photos that are slightly above or below the dog's eye level. Try different angles such as a three-quarter view of the body, full face, and profile shots. Experiment. 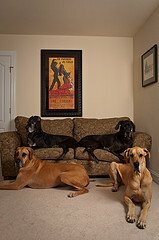 The great thing about Great Danes are they are goofy by nature so if you just let them be themselves you will get some get pictures.